Diamonds may be a girl’s best friend, but why are they a girl’s best friend? Why are diamonds considered to be such a hot commodity when it comes to jewelry? While the clarity and sparkling appeal of a diamond is obvious, why it is so highly valued and popular may not always be so clear. It all comes down to the four C’s of diamonds: Cut, Clarity, Color and Carat. The cut of a diamond is one of the biggest factors that affect value. The cut is not the actual cut itself, but how the diamond interacts with the light and how the diamond is finished. In actuality, it is more of a critique on the jeweler who cut the gem, not the shape (princess, emerald, etc.). The American Gem Society defines the cut of a diamond on a rating scale from 0 to 10 (0 being the best and 10 being the worst). A diamond with a good cut will sparkle more than a diamond that does not. The definition of clarity when it comes to diamonds is the transparency of the stone itself. Blemishes, which are irregular features on the surface of the stone, and inclusions – internal deformations or features – can obstructing views through the stone and affects the overall clarity of the gem. Ideally you would want the gem to be completely transparent. The Gemological Institute of America rates clarity on a scale from I3 (included) up to flawless, which is incredibly rare. The color of a diamond – or the lack there of, more precisely – also affects diamond value. Diamonds are examined before being set to determine the overall hue of the stone. Jewelers will judge the diamonds based on the master set that they have, ranging on a scale from D (the most colorless) to Z (lighter or yellower). For example, chocolate and yellow diamonds, which have become trendy in recent years, are actually considered to be on the lower end of the color spectrum. Diamonds near D on the GIA color scale are colorless, and command a higher value. A carat is perhaps the simplest factor to understand as it comes down to the stone’s weight. You’ve probably heard “carat” in reference to diamonds, and that is a unique of weight measurement that equals 0.2 grams. The size of the diamond does affect the value, as well. 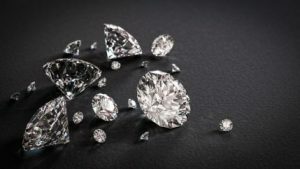 Larger stones are more rare, which means that even when comparing diamonds of the same quality in all other ways, a stone that is larger will nearly always have a greater worth. At Frank Pollak & Sons, we specialize in valuing, buying and selling jewelry in New York City. If you’re looking to sell your diamond jewelry, let us know, and we can appraise your item and make you a fair offer based on the quality of your gem and setting. We have over a century of experience and we will make sure that you are receiving an honest deal. Before you take a lower offer elsewhere, call us today at 800-342-3878.